Our guest today is “Rhymes with Bug,” so time to grab your coffee mug (or tea, or what you most prefer), and join me in my time with her whose real name’s Candace Kubinec, which I can’t rhyme. So what the heck, let’s jump into this interview to learn some things we never knew about this poet in our midst who writes the poems we can’t resist! MARIE ELENA: Hi Candy! Thank you for sitting down with me to chat a bit. Walt and I love being able to get to know more about the people we rub poems with here in our garden. And speaking of gardens, your blog name (“rhymeswithbug”) fascinates me. It’s just the cutest thing! You actually say bugs are your little muses. That made me smile, and want to know more. CANDY: I’ve always been an “outsider” – I mean an outside girl. 😉 There is an amazing tiny world out there that most people just pass by. I’ve been a garden-for-fun person for most of my life. I remember having my very own flower garden in elementary school, even though neither of my parents were gardeners. About seven years ago I became a Penn State Master Gardener and that was when I really started paying attention to the world of insects. I took pictures of every critter I came across – it is amazing what you find when you begin turning over leaves. Seasons, weather, birds, animals, and of course, bugs – all muses for my poetry. MARIE ELENA: That’s just so endearing, Candy. And a Penn State Master Gardener? That’s awesome! How did that come about? CANDY: I found out about it from a friend at work. The purpose of the program is to serve as a resource for science-based gardening information to the public. The steps to becoming certified begin with an application. Then there is an interview, about 90 hours of college-level education, and a test. This is a volunteer organization, with education as our main function. To maintain our certification, we must meet volunteer hours and continuing education requirements yearly. MARIE ELENA: How fun. Impressive, actually, and sounds like a lot of work. I can tell it is a passion of yours, along with your poetry. 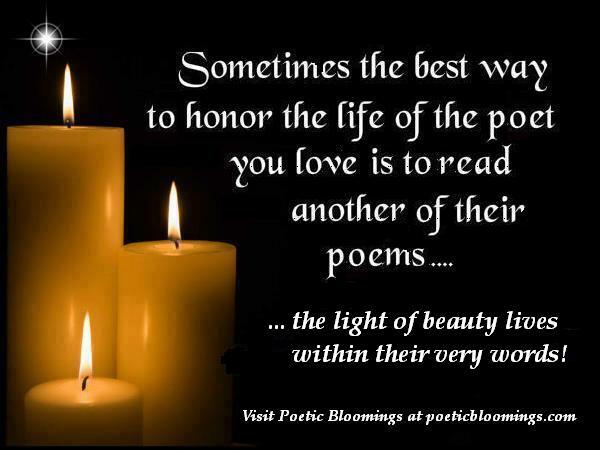 Will you please share one of your favorite poems (one of your own) with us? CANDY: I have to tell you, I had so much fun reading through what I’ve written over the past three or four years. It was like reading old diary entries. This, I think, is one of my favorites. It was written in response to a prompt at d’Verse Poets Pub in February of last year. It’s an Ekphrastic poem inspired by a painting by Catrin Welz-Stein of an elephant and a tiny cat together in a small boat. It speaks to letting go of prejudices and preconceived notions and getting to know each other better, one person at a time. I think that is the path to peace. MARIE ELENA: That is just lovely and insightful. The peace is palpable. Thank you for sharing it with us. So how did you get into writing poetry? CANDY: I think it may be the other way around – poetry got into me. It probably started with nursery rhymes. Unfortunately, I don’t remember learning or memorizing poetry at school. My mother did keep a poem I wrote when I was thirteen – I found it among her things after she died. I also have a notebook of things I wrote in high school. Mostly typical high school girl stuff, but proof that I was writing. MARIE ELENA: It makes me smile that your mom kept a poem you wrote as a teen. Do you write anything else? Novels? Perhaps short stories? CANDY: I have written some short stories (mostly flash fiction) and have had some published in a local literary journal, The Loyalhanna Review, and I’ve had a number of 50 word stories featured on fiftywordstories.com. I get bogged down in the middle of short stories, so I don’t see me writing a novel, although, I’ve had ideas. MARIE ELENA: Congratulations on your publications! What are your goals in writing? CANDY: I write for the pure enjoyment of creating. I especially like to write poetry for friends – to make them laugh, or smile in that I-hear-you sort of way. MARIE ELENA: What (if anything) gets in the way of writing, for you? CANDY: Well. I’m retired, so if anything gets in the way of my writing it would be me. Or, maybe some other project I’m working on – painting, sewing, gardening – so many ways to express myself. Also, I read, a lot. I’m a chain reader – ready to “light up” the next book before I’ve finished the one I’m reading. MARIE ELENA: “Light up the next book.” That gave me a good chuckle! What do you most enjoy about writing? CANDY: What I’ve learned about myself is that I need to be creating – something. And what I make, I like to give away. Poetry fills that need in many ways. MARIE ELENA: How lovely and generous, Candy. Is there anything that bothers you about the process of writing? CANDY: At this point in my life there is not much that bothers me. Since I’m not looking for a career, money, or fame, there’s no pressure. If the words don’t come, I let it go for a while. Most likely I pick up a book. MARIE ELENA: What a great attitude. That’s good advice for all of us to heed. As with the majority of us here at Poetic Bloomings, we met online at The Writer’s Digest’s Poetic Asides with Robert Lee Brewer. How long have you been sharing your poems online? CANDY: I think it was sometime in 2013 that I found Poetic Asides. I started doing the Wednesday Poetry Prompts (still do). My first Poem-A-Day challenge (PAD) was in 2014. I wasn’t sure I could actually write a poem every day, but I managed to post something each day. It was May of 2015 that I started my blog because of a suggestion that De Jackson (whimsygizmo) made. MARIE ELENA: Leave it to De! I’m glad she encouraged you to get that blog created. Have you ever shared your poems in a public space, like a poetry slam? CANDY: For the past five or six years, I’ve attended the Publication Party for The Loyalhanna Review and I usually read one of my poems or part of a short story that is included in the latest issue. I have always loved to read out loud and my job, as Corporate Activity Director in a retirement community, had me speaking in front of groups on a regular basis. I did poetry groups with residents too, and presented a session on writing poetry with residents at a conference once. I’ve come a long way from the shy little girl I once was. MARIE ELENA: Corporate Activity Director in a retirement community? Apparently the hats you’ve worn in your lifetime have been many and diverse. My parents lived in a very nice assisted living community. They had a woman there for a while who had a similar title as yours. She was such a lovely soul, who genuinely loved the residents. We were sorry to see her leave. She made a difference in their lives. I’m sure you do, too. MARIE ELENA: *sigh* Yes. You’ve got it, Candy. Just, yes. Now, back to writing for a moment. What can you tell me about your writing space? CANDY: I do not sit at a desk. I have a favorite soft chair with an ottoman. It is in a room we call the library, only because it has three tall bookshelves. So, I do my best writing when I am alone, sitting in my favorite chair, with my feet up. I used to write in journals, but now I use my iPad. I would change nothing about my space. MARIE ELENA: We are alike in that manner. Sounds perfect, to me. So now we can picture you writing in your comfy chair in your home in Pennsylvania. Is that where you grew up? CANDY: I grew up in Greensburg, PA., a mid-sized town about 35 miles east of Pittsburgh. MARIE ELENA: How did growing up there help form who you are now? MARIE ELENA: Again, that sounds pretty perfect to me. MARIE ELENA: Two granddaughters? Another thing we have in common, Candy. Can’t beat it, eh? It sounds like you have lived a relatively simple life, and appreciate all you have. If you could change one thing though, what would it be? CANDY: Well, nothing. Here’s why – If I changed one thing, many other things would also have to change. I have the two best sons in the world, the two most adorable and intelligent granddaughters in the world, the dearest friends any one could ever need, and a husband who loves me. Why would I want to change? I have, of course, played that “what if” mind game. But my answer is always the same. MARIE ELENA: That is just fabulous. I feel the contentment just sitting here “chatting” with you. Let me ask you this: In spite of (or in addition to?) your obvious sense of contentment, do you have a bucket list? CANDY: No ticking off items on a list. Instead, I’ll start with an empty bucket and enjoy filling it with all the wonderful surprises life throws at me. MARIE ELENA: “I’ll start with an empty bucket and enjoy filling it with all the wonderful surprises life throws at me.” Love it. And that poem is up toward the top of my list of “favorites” of yours. Worth the price of admission, right there. Candy, it has been an absolute joy getting to know you better. It seems that over the years, your poems have been a reflection of who you are at your core. Thank you for allowing me to delve a little deeper. Plus, it was so much fun having some of your responses accompanied by appropriate poems! Brilliant! And now, as always, I’ll close the interview with this: If there was only one thing we could know about you, what would you want it to be, and why? Always great finding out what makes our poets tick. I’ve waited for this chat for a while, and Candace, you’ve delivered as you poetry bears out. It’s funny that you pinpoint your beginnings as poet, when it seems we’ve known your work for so much longer than that. I’m happy that you find favor to contribute here as well as the aforementioned sites. And happy Marie chose to present you in her usual fine fashion. It certainly proves the point, Candy is dandy! Awww … thanks, Walt. This is a good place to be. I loved learning about you and your Creativity Candy! It is a pleasure to get a glimpse into your mind. Thank you MEG for another wonderful interview. I enjoy Candy’s poetry and the interview. Thanks! Through these interviews, I’m finding that as poets, so many of us have more in common than we might think. Great getting to know you better, Candy. Write on. What a delightful interview! I love and identify with your poem Haphazard Words. Candy, love your Haphazard Words here, and these other creative gems of poetry. Enjoyed the glance into your life and writing. So glad you are part of the garden.